This time of year is among my favorite because I just love decorating for the Fall season and for Thanksgiving with my family. Thankfully, decorating for Fall doesn’t need to be expensive at all especially if you have a Goodwill Store. With a few inexpensive tools and some items from our favorite thrift shop, you will have all you need to start decorating your home for Fall. Here are six fun ways to decorate your home for Fall using some commonly found items from the Goodwill Store! Vases are readily available at Goodwill and there happen to be dozens upon dozens of sweaters just waiting to adorn those vases. 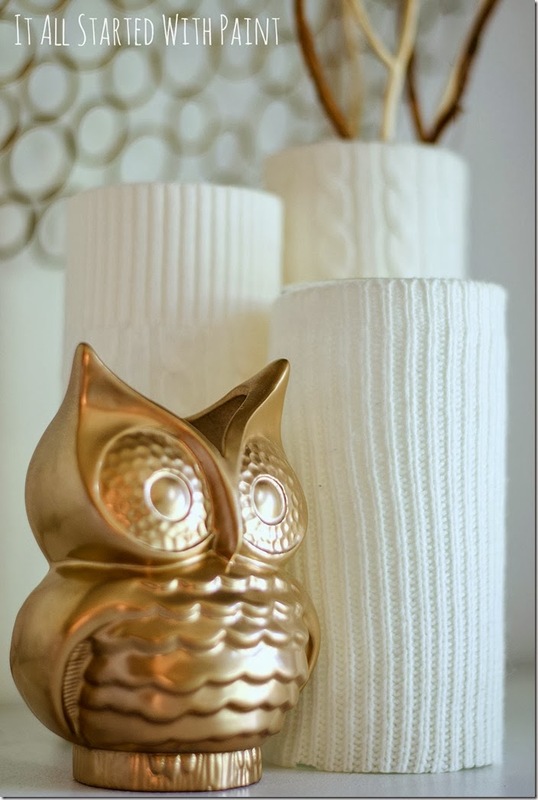 Select a color scheme that goes along with your home and simply glue the sweater fabric to your inexpensive vase. Fill your vase with bare branches from your yard and you have a beautiful and cozy vase to decorate your mantle! As someone who lacks the sewing gene, I totally love that this craft is a no-sew project! Check out Made From Pinterest for the scoop on this adorable craft. Making a wreath can be time-consuming and buying a wreath can be expensive. 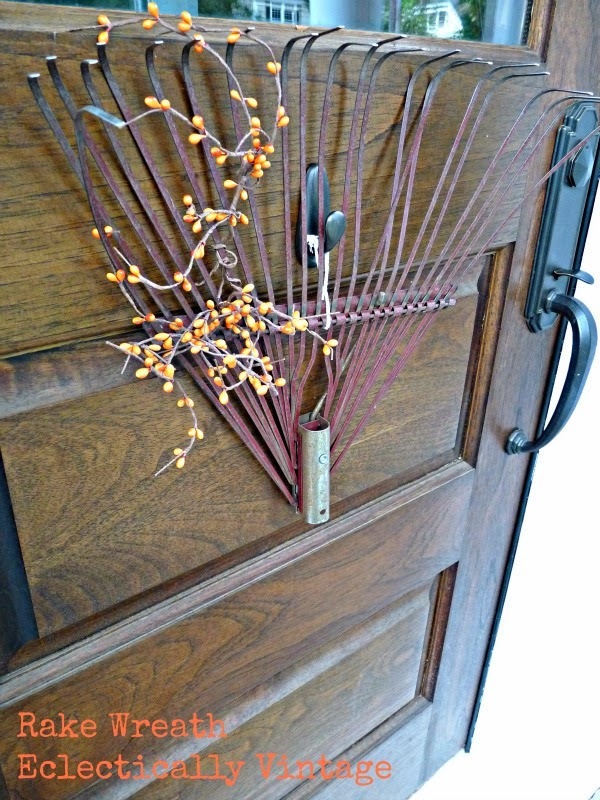 Why not decorate your door beautifully and simply with the top of a rake. I love this adorable rake adornment for the front door dressed simply with a little sprig of Fall branches that you could pick up from the craft shop. You could even spray paint this to match your front step decor. This would also be such a fun way to decorate a shed door! Visit Eclectically Vintage for some beautifully thrifted inspiration! Sweater crafts are all the rage for Fall and I love the idea of creating a centerpiece of pumpkins that have been covered in cozy sweaters for the Fall season. On the StoneGable blog, you can find some fabulous instructions for creating a few cozy pumpkins of your own. I love that they chose this white color scheme for the pumpkins because these could remain out for Winter decor too! Be sure to look for sweaters with interesting cabling schemes and chose sweaters with different textures to really make your pumpkin centerpiece stand out! 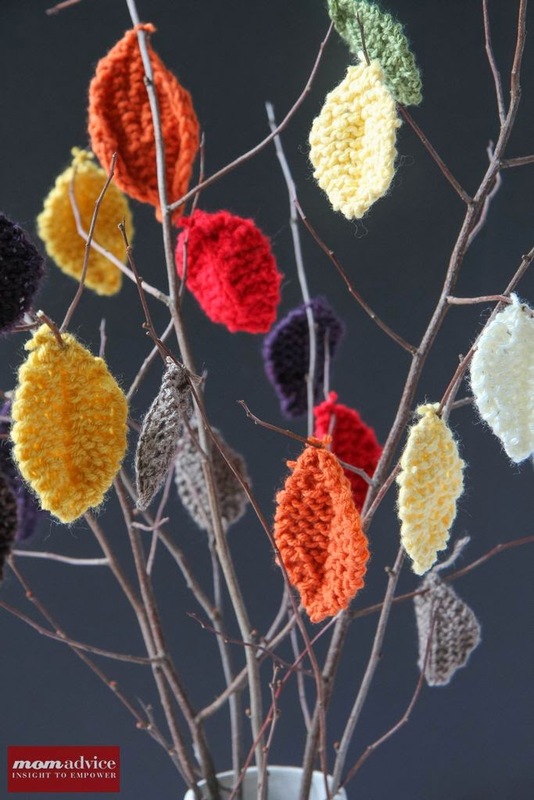 While bare branches can be beautiful, it can be fun to spruce them up and adorn them for the Fall season. Yarn is a commonly donated Goodwill item and this year I made my very own little Knitted Leaf centerpiece out of scrap yarns that I had. Leaves can be made out of just about anything though, consider cutting leaves from sweaters or book pages to create your own unique centerpiece and place them in a pretty vase from Goodwill. Are you hosting a Thanksgiving dinner this year? Consider making a unique centerpiece out of a book from Goodwill. 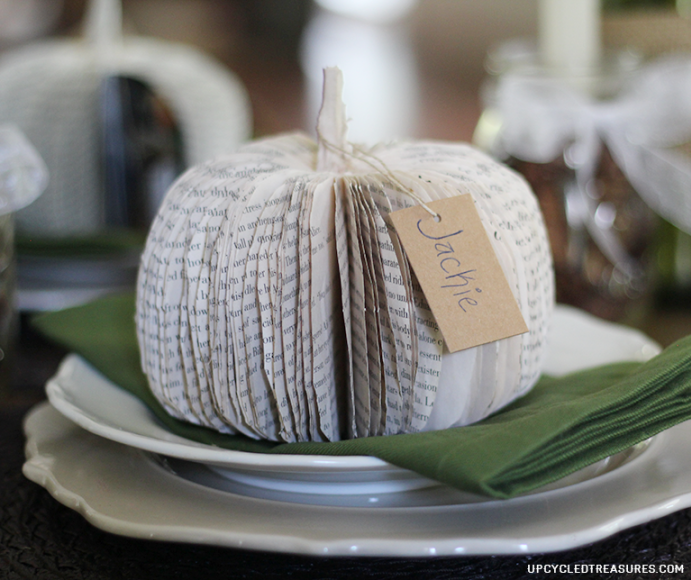 These book page pumpkins make a beautiful place setting that could later sit on a side table, ledge, or mantle after your dinner is done. 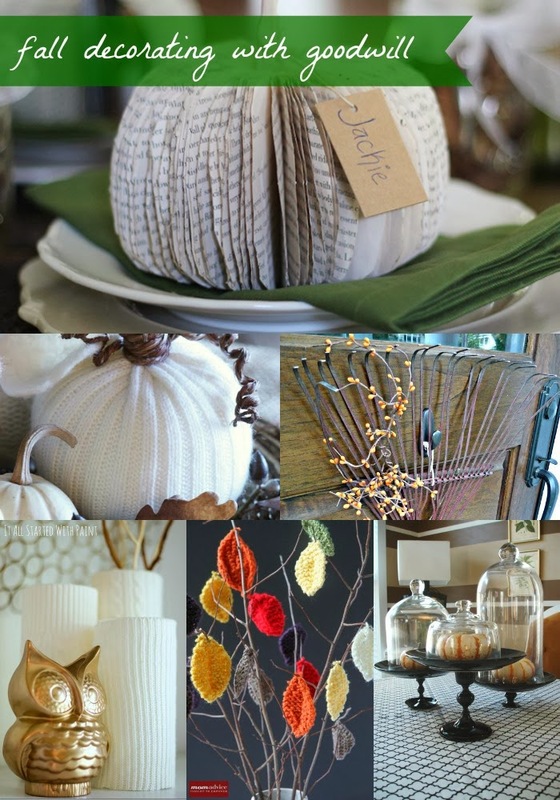 Check out Upcycled Treasures for a great tutorial on how to make these for your own Thanksgiving table. Of course, regular readers know that we are BIG fans of book page crafts over here so be sure to check out our fantastic round-up of things to do with old books! Cake stands are so easy to make with just a candlestick holder and a plate. Spray paint them to create a cohesive collection and place these on your buffet table or mantle. Head to the local farmer’s market or grocer to find interesting pumpkins to adorn the top of these stands. Check out this easy tutorial from Dwellings by Devore to get the scoop on how to make these for your own home! I am wishing you the happiest of Thanksgivings this year! I hope these ideas will help you with decorating your own home for the holidays!